Cats and dogs lick anything that adheres to their fur, small children touch surfaces and put their hands into their mouths directly afterward, and many cleaning products are toxic if inhaled by pets or people. The best way to protect all members of a household is to use environmentally friendly, non-toxic cleaning solutions. Chemical cleaners containing phenol and phenol derivatives such as naphthol, wood tar, and creosote – Pets can die if they consume these ingredients and even inhaling the fumes of certain products can cause illness. Chlorine – A common ingredient in household bleach, chlorine is toxic if inhaled or licked. Toilet bowl and drain cleaners – Because they contain corrosive alkalis and acids, physical contact with these products can damage eyes and skin. Baking soda – This is good for cleaning bathrooms, particularly removing soap scum, and is far safer than chemical cleaners. Be sure to wash the area thoroughly, however, as ingesting large amounts is unhealthy for pets. Green commercial products – Green cleaners are derived from plant extracts. Common brands include Seventh Generation and Simple Green. Lemon juice – Lemon juice is safe, but citrus oil, often used in furniture polish, can be toxic to both cats and dogs. Furniture polish can be made from lemon juice rather than citrus oil: mix 1 part lemon juice with 2 parts olive or vegetable oil and apply with a soft cloth. A vinegar and oil solution may also be used, and the amount of oil can be reduced if it leaves the wood too oily. 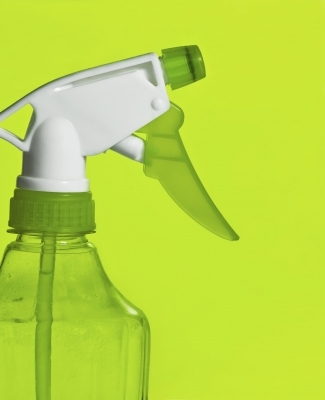 Stabilized chlorine dioxide – This odourless disinfectant kills viruses, bacteria, and fungi, but does not harm cells or generate toxic by-products. Vinegar – Vinegar is great for killing bacteria and odours on kitchen surfaces, cutting boards, and windows, as well as removing stains from clothing. 1 cup baking soda, 1 cup heated vinegar, 2 quarts hot water – Pour the baking soda down the drain first, followed by the vinegar, and pour the water in 5 minutes later; repeat several times if necessary. 1 cup baking soda, ½ cup salt – Pour both down the drain and leave for several hours (preferably overnight); then flush the drain with 2 cups of boiling water. Non-toxic enzymatic cleaners can be used to remove stains and odours caused by cat urine. Nature’s Miracle not only removes odours and stains, but also the chemical markers in the urine that encourage a cat to urinate in the same place over and over again. Other popular enzymatic cleaners include Zero Odor and X-O. Most pesticides are extremely toxic, and there are far safer ways to deal with indoor and outdoor pests. You can spray pure vinegar or a vinegar and water solution around areas where pests are likely to enter the house, such as baseboards. For more environmentally friendly ways to prevent and eliminate pests, see Natural Flea Control and Natural Garden Pest Control. Pests on houseplants can be removed by washing leaves and stems with a solution of lukewarm water and non-toxic insecticidal soap or dish soap that does not contain degreasers, which may damage leaf cuticles. A soft cloth can be used to apply the solution, or the plant can be held upside down, dunked in the solution, and briefly swished around, using a tinfoil shield to keep the soil from falling out of the pot. Aguirre, Sarah. (n.d.). “Unclogging and Freshening Drains with Baking Soda.” About.com. Bond, Annie B. (27 July 1999). “Alternative Furniture Polish.” Care2.com/greenliving. Drs. Foster & Smith, Inc., Veterinary & Aquatic Services Department. (26 September 2008). “Citrus Oil Toxicity in Dogs and Cats.” PetEducation.com. Gardener’s Supply Company. (n.d.). “Wash Your Houseplants to Prevent Pest Problems.” Gardeners.com. Hotchner, Tracie. (2007). The Cat Bible: Everything Your Cat Expects You to Know. London: Penguin Group. Syufy, Franny. (n.d.). “Clean Green for a Cat-Safe Home.” About.com.